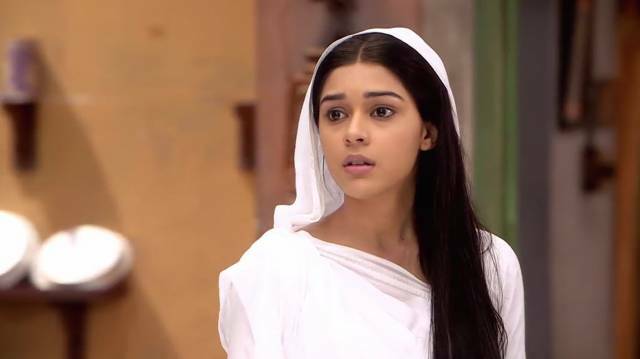 Ishq Ka Rang Safed 21st April 2016: Dadi Bua came back home and thought that Nurse was lying. She thought to expose Dhaani and tried to get poofs from her room. She found a man’s chappal and thought Viplav used to wear those. She called Sushma and Dasharath and showed the chappal asking whose they were. Kanak said it was Viplav’s chappal. Dadi Bua said it was found in nurse room. Dadi bua told Dasharath that Dhani was trapping Viplav. She said that was why she sent him out when she called her. She asked them to throw Dhaani out before Viplav came in her trap. Viplav brought Dhaani home, heard Dadi bua and asked what she was telling. Dadi bua said that she had seen the world and knew what was going on. Dhani stated that she thought if she took Viplav’s name then she might have thought him wrong. Dadi but threatened Dhaani. Dasharath asked Dadi bua to get busy in Shalu’s marriage function. Dadi bua talked on the phone and asked someone to come fast. Viplav went out and romanced Dhaani. He said he got tickets for Dadi bua, and then no one would be there to stop them. He covered themselves in curtains and asked everyone to look another side. He got closer to kiss her. Mere Ishq Ka Rang Safed played. They laughed and hugged. A car came and stopped. A girl reached there and told Dadi bua that she had come. Viplav asked Dhaani to come out. The girl got caught in the dupattas flying outside. Viplav saw her and assumed she was Dhaani. He smiled and found her in arms. She revealed her face. Dhaani came there and looked at them. Bua Ji came. She told Viplav that she saw him what he was doing. She asked him to wanna get married. Viplav said no, he just saw the arrangements. Bua said looked where he had to. Meet her she is Kamini. She lived near her place. She asked her to come there and meet everyone. She met her in the temple. She liked her at first sight. She was perfect. Kamini met everyone. Mahant said she was like a daughter to them. Bua asked Viplav sit there. Dhaani came to her room and asked Viplav whom he hugged. Viplav said that he thought it was she. She stated that he couldn’t even recognize her. Viplav laughed. Dhani stated that she cannot see someone close to him. He hugged her and said he couldn’t think of any other girl. Don’t cry, please. He said it was a mistake. Their love can be never apart ways. Their relation was based on love and trust. She said she believed him but feared. She asked did he like her. She hugged him.